Maryanne’s musings: There is actually a bit of a story behind this one. I have two horses; a Friesian crossbred called “Halo,” and an aged thoroughbred, “Jackson.” Poor Halo needs hardly anything to eat and he can’t be on pasture in Spring. Jackson can be on pasture all year round. This year’s separation came earlier (unlike the horse’s comment about the first day of Spring). Halo managed to get too fat on Winter pasture, plus he’s been a bully to old Jackson. So the temporary fence has gone up and this comic was a little nod to Jackson getting one over Halo, even though that would never happen in real life. Jackson is far too submissive and flighty. 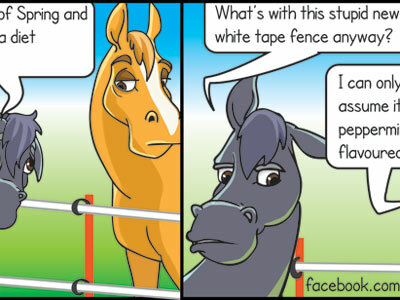 Originally it wasn’t going to be Halo and Jackson in the comic, the idea just came about after an hour spent setting up the fence to section off the paddock. So the proportions and features aren’t true to Halo and Jackson in real life. I also had to do a lot of final adjustments because I’d missed things when working on the line-work. It’s much better to decide you’re happy with it early on then try to make late changes where you have to overdraw things. I changed ears, I changed two of the faces and completely flipped Jackson’s muzzle in the 2nd panel. It was sort of twisty which I thought looked dynamic (scoff! chortle! ), but when I looked at it with fresh eyes it just looked wrong so I changed it to the easier representation of having the mouth visible on the side where you get the most face. Also in the 2nd panel I realised I had both their eyebrows doing the same “one down, one up” thing that Jackson’s is doing, so I changed Halo’s to be both down. I forgot to draw eyebrows on Halo in the first panel. Plus the Halo in the last panel had a thin cheek. There’s usually nowhere near that amount of structural changes once I’ve put down colour so this one takes that trophy. Would I like to make more changes? SURE! HA! Halo’s ears in the 3rd panel should be longer and the electric tape in that panel should be visible continuing behind his jaw. I think I will have to change that bit before it’s printed in Horse Deals. The other tricky thing with this one was compressing it all into the format for 190x50mm print. It would have been funny to show Halo’s tongue inching closer to the wire in close-up and then linger longer on the punch-line -Maybe have Halo recover to shoot Jackson a glare and a wider shot so we could see Jackson’s angelic “I knew that would happen” expression. The “zap” could have also been it’s own panel and I had to try a few different representations before I was ok with it. Originally Halo was going “Mmmm!” as he zeroed in on the wire.